Are you still wondering what happened to Marcus Wells and his fiancée Emily? I’m pleased to announce that the answer will be coming soon! 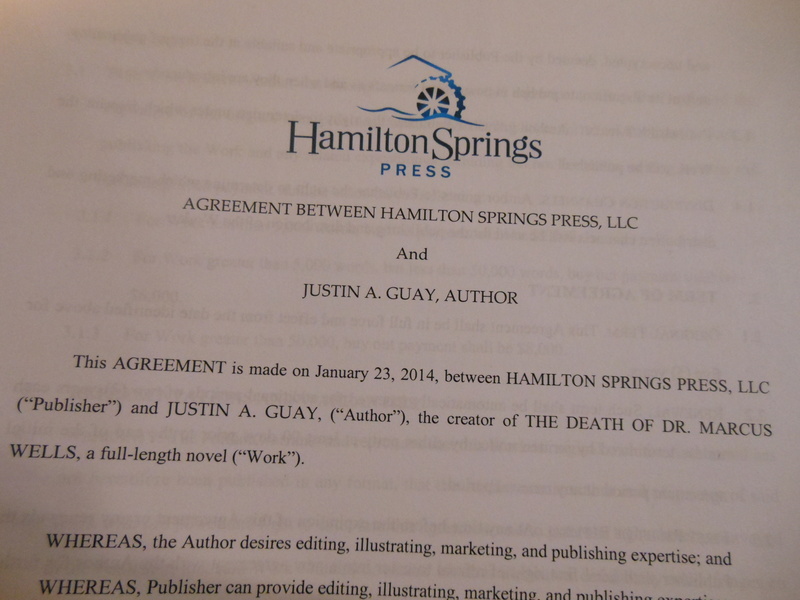 I’ve signed with Hamilton Springs Press/Xchyler Publishing to develop a full novel based on my published short story ‘The Death of Dr. Marcus Wells’ in ‘Shades and Shadows: A Paranormal Anthology‘. We are still in the beginning phases of development, so don’t look for the finished work until sometime in 2015. In the meantime I really want to know what you liked best about the Marcus Wells story. Was it the Gothic London vibe? The mystery of the plot? the rationalized werewolves? Let me know because this novel is going to be for YOU my readers! So…in contrast to how this blog has been going lately, my offline writing life has been going remarkably well as of late. I’ve managed to write on most mornings, having flitted between a couple of projects to keep myself from getting stuck on any one of them. Things are going so well, in fact, that I’m now considering a return to my main WIP. I spent several hours this weekend going over and revising my notes on the project, and hope to get started on writing it again by Tuesday. What’s that you say? – Thank you to my fans! The biggest highlight for me, however, was the final story. “The Death of Dr Markus Wells” is a truly spectacular piece of fiction that will thrill and horrify you in equal measure, and it was a fine note to end the collection on. “The Death of Dr. Marcus Wells” by J. Aurel Guay – this is the one story in the collection that I wish had been expanded into a novella or even a full-length novel. Guay builds a world with a creepy Victorian vibe – think Drood-era Dickens – and then populates it with creepy viral monsters. The story is great fun, but there are enough unanswered questions that this reader, at least, hopes Guay will revisit this world and its stories in the future. “The Death of Dr. Marcus Wells” read like it could have been the pilot for a cool, uncanny drama on TV. From the beginnings and a bogey man to a closing full of were-folk, this collection has it all. A great read for a great price! “China Doll” and “The Death of Dr. Marcus Wells” are my favorites. I bought this book because a colleague of mine wrote one of the short stories (The death of Dr. Marcus Wells). Needless to say that I read this one first. I really enjoyed all the detail he put in there. He managed to set the scene well without using to many words. Thank God the ending does not leave me with any nightmares! 🙂 I am looking forward to reading the other short stories from this collection as well. A friend kindly published this guest blog promoting my anthology story and telling the tale of how it came to be. Run for the Hills! It’s coming TOMORROW! Beware of the dark this Halloween. ‘Shades and Shadows: A Paranormal Anthology’ will be knocking at your door. You are all cordially invited to our virtual launch party for Shades and Shadows featuring my story ‘The Death of Dr. Marcus Wells’. What is a virtual launch party you ask? Well simply follow the link below to the Facebook page on October 31st at 7 PM (EST) to find out! All the authors will be on the page posting live. We will have contests for prizes and swag, discussion of each book and lots of fun! Please join us, show your support and win some prizes! Oh, and did I mention that SyFy’s Ben Hansen, writer of the forward for our anthology, will be there? Take me to the Launch Party!